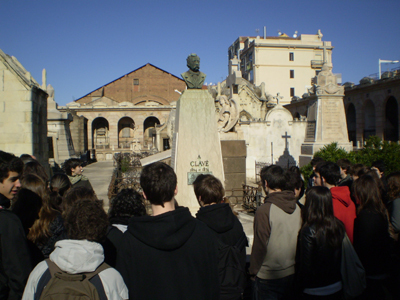 Visit the cemetery of Poblenou is a historical walk for the first cemetery of the city and, in fact, also a walk on the history of Barcelona from 1775 until the conclusion of the Exposition of the 1888 and the last years of the nineteenth century. This visit is a walk for the years that transformed Barcelona into a modern city. A walk by the ideals and ambitions of the citizens, and the obstacles and conflicts that opposed to them. A walk for the splendor of his accomplishments and the pain of their confrontations and failures. This walk bring us close to the innovative impetus that led to technological and scientific progress that shared the Industrial Revolution and changed the appearance and customs of the city. This way also makes us understand the emergence of new civic and moral values that was imposed and the new political ideologies. In short, the route for the cemetery is a walk for the construction of the new bourgeois world in Barcelona. Timetable: de dilluns a divendres, de 8 a 18 hores.